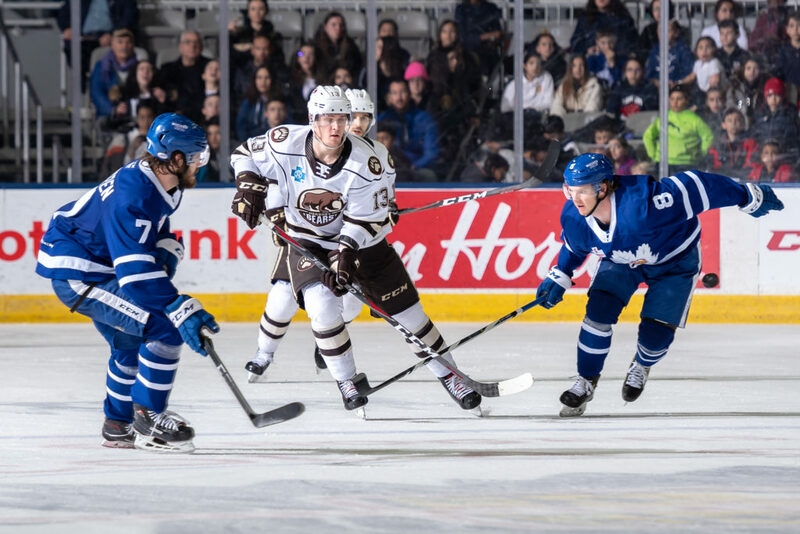 The Toronto Marlies suffered a tough loss at home Wednesday afternoon, dropping a 3-0 decision to the visiting Hershey Bears. Three goals in the first period gave the Bears a cushion and the Marlies were unable to climb their way back from the deficit. Jayson Megna opened the scoring early on with a strong individual. Megna skated through traffic from the defensive zone and beat Michael Hutchinson with a wrist shot that went top shelf over his catcher. The Bears then capitalized on a power play at 15:19 as Mike Sgarbossa fired a shot glove side from the hash marks that beat Hutchinson. 14 seconds later Brian Pinho made it 3-0 for the Bears. Kasimir Kaskisuo then entered the game to relieve Michael Hutchinson. The Marlies went 0/4 on the power play and put 17 shots on Ilya Samsonov. They’ll now hit the road for a tilt in Utica tomorrow against the Comets before closing out the three-in-three on Saturday in Binghamton. Michael Hutchinson stopped 2 of 5 shots he faced. Hutchinson’s record with the Marlies is now 14-5-3-0 on the season with a .909 Save Percentage and a 2.85 Goals Against Average. Kasimir Kaskisuo replaced Hutchinson in the first period, stopping all 17 shots he faced. Kaskisuo is now 10-9-3-1 on the season with a .891 Save Percentage and a 3.20 Goals Against Average. This is the first time Toronto has been shutout since February 22 in an overtime loss to Syracuse. Toronto is 22-10-4-2 since January 4 and have outscored their opponents 121-106, facing 17 different teams. In 28 of 38 games, Toronto has earned a point (50). Toronto was 2-for-3 for on the penalty kill and was 0-for-4 on the power play. 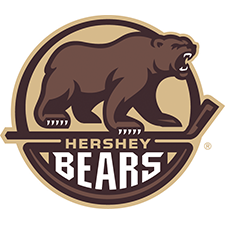 Hershey had a 22-17 edge in shots in all situations. Adam Brooks led the Marlies with four shots on goal. The Marlies are 10-7-0-1 against Atlantic Division opponents and finish the season 1-1-0-0 against the Bears. The Marlies are 4-14-3-2 when trailing after the first period and 3-17-2-1 when trailing after the second period. Toronto is 17-13-3-2 when outshot by their opponent. The Marlies 6-5-0-1 in Wednesday games and are 0-1-0-0 in April. March 31: Recalled defenceman Calle Rosen from loan by Toronto (NHL). We just have to take the lesson, that’s a real hockey team that’s been as good a team in the league here in the second half of the season and they showed it today. They’re ready to play, they played fast and hard and competitive and we weren’t ready for that and weren’t prepared for that. The guys didn’t seem willing to compete in that type of environment. We made some mistakes early and didn’t get saves that ended up in our net and it’s a tough road back from there. I thought the play of Kaskisuo was outstanding coming in in tough circumstances. He looked really confident in the net and he gave us a chance for the team to play and find our way back. Unfortunately, on the offensive side of it, we weren’t able to do anything with it but certainly Kas looked great and carried forward his play from Laval the other day with a shutout and looked very good in that game as well. His play I thought was a real positive as was the play of Mason Marchment. It was nice to see him come back here and I thought he had good legs today, he was one of our guys I thought was really pushing. He was competitive and he looked comfortable in the environment out there. So those would be the two positives I take away from it. Well that’s just it, that’s the message that we talk with our team about after. It’s game 71, we’re a team that still has not secured itself a playoff position and the way we played today, we look like a team that doesn’t want anything to do with the playoffs. That’s not the attitude that we want to have and that’s not the way we want our effort to be reflecting. We’ve got to make a decision here, this is important and we have to find a way to play a lot better. I mean, we went to Utica last week and won the hockey game but we were outplayed for most of the game, it’s been frustrating that we haven’t been able to put together consecutive games, we haven’t been able to find our game but we’re going to have to make that decision here on this bus trip. I’m just telling them how important these games are. The Toronto Marlies return to action today to host the Hershey Bears for an early start at Coca-Cola Coliseum. These Eastern Conference rivals are meeting for the second and final time this season. The Marlies have a 1-0 lead in the season series following a 5-4 overtime win in Hershey on March 15th. The Marlies are coming off a 3-0 win over the Laval Rocket that saw leading goal scorer, Chris Mueller record the Marlies’ first hat trick this season. They are 22-9-4-2 since January 4th and have outscored their opponents 121-103, facing 17 different teams. In 28 of 37 games, Toronto has earned a point (50). As they head into their final six games of the season, the Marlies are 22.5% on the power play and 81.5% on the penalty kill. Their game against Laval on Saturday was the first time this season the Marlies did not take a penalty. They currently sit third in the North Division and fifth in the Eastern Conference with 85 points; seven points ahead of the fourth place Belleville Senators, and seven points back from the second place Rochester Americans. Hershey is coming off a big 3-2 shootout win over their division rivals, the Bridgeport Soundtigers. With wins in their previous two contests, the Bears sit third in the Atlantic Division and sixth in the Eastern Conference with 83 points. Players to watch: With his second goal on Saturday, Chris Mueller established a new Marlies single-season franchise record with 31 goals in a 76-game season. Mueller has 22 points (13 goals, nine assists) in his last 14 games. This is his second 30-goal season of his career. With two assists on Saturday, Jeremy Bracco extended his point streak (4-12-16) to 10 games. He has 26 points (six goals, 20 assists) in his last 23 games. Bracco is tied for the AHL-lead in points (75). Puck drops at 11AM on Leafs Nation Network and AHLTV. Fans across the nation can also stream the game live in the Toronto Maple Leafs app.